To order a printed copy of the 2019 Eastbourne brochure, simply click the order button below and one will be sent to your registered address. View the Eastbourne 2019 Brochure Online Brochure Now! Welcome to the Sunshine Coast. Your perfect coastal escape starts here. Stroll along three miles of pristine palm tree-lined promenade, step onto the iconic Victorian Pier, take in a show at the elegant 1930's Bandstand or simply gaze at the breath-taking beauty of coastal landmarks at Beachy Head and along the Heritage Coast to the Seven Sisters. The sunny seaside town is the ideal spot just over an hour away from London nestled between the historic 1066 Country and the magnificent South Downs National Park. Savour unspoilt coast and countryside, splendid Victorian architecture and glorious seafront gardens. Immerse yourself in the heritage and cultural attractions and year-round programme of events and live entertainment and discover cosmopolitan harbour and cuisine from around the world in the great restaurants. 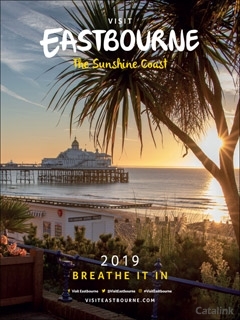 Eastbourne 2019 Brochure Carol F. said: Very informative and well laid out. Good magazine, well done! Eastbourne 2019 Brochure Tony H. said: Very helpful. Eurocamp has been giving families holidays to remember for 40 years and in 2019 they are offering even more than before. Choose from 180 different locations &#8211; beside the beach, in the countryside or amongst stunning mountain views.